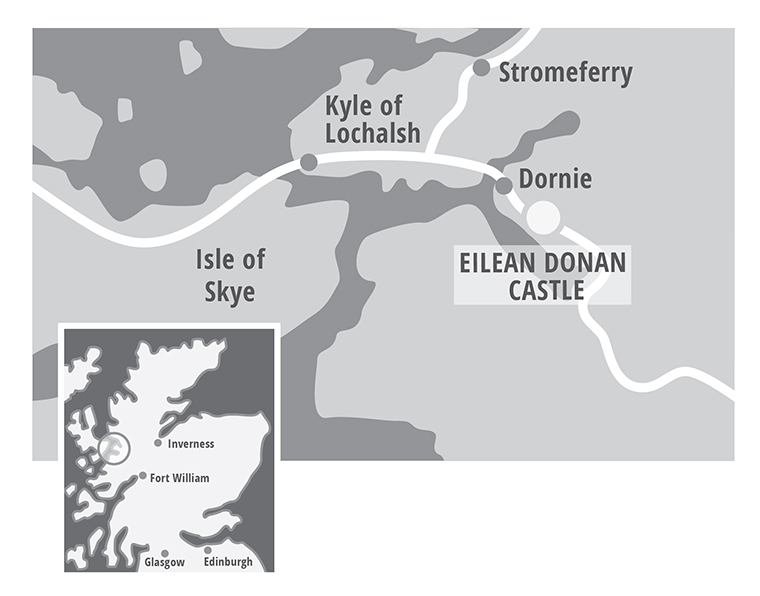 At the meeting point of three sea lochs on the west coast of Scotland, Eilean Donan is situated by the picturesque village of Dornie on the main tourist route to the Isle of Skye. From the Castle you can walk to Dornie at the mouth of Loch Long, see the Cuillin mountain range of Skye in the distance across Loch Alsh or look to the head of Loch Duich towards the dramatic Five Sisters of Kintail. Travel a short distance to visit the outstanding brochs of Glenelg built over 1500 years ago, wander through the Lochalsh Woodland Garden at Balmacara or climb up to the Falls of Glomach. The Isle of Skye is easy to visit either by ferry at Glenelg or by bridge at Kyle of Lochalsh (8 miles from the Castle).